It's barely December, and Thanksgiving was a mere three days ago, but it's Christmastime in Tinseltown. But it doesn't stop there. We also saw the likes of Fred Willard, Neil McDonough, the cast of "Grease" (yes, three guys from the 1978 movie you wouldn't recognize unless they were sitting on top of a convertible waving at a crowd with the sign "Cast of Grease" attached to its side panels) and, drum roll please, the Church of Scientology "Winter Wonderland" (pictured above). The best part for me, and speaking for C, too, besides seeing her da d work the swelling crowd, was walking out onto Hollywood Boulevard from H&H and seeing the El Capitan Theater exploding with light for C's new favorite movie: Bolt. Not that she's seen it, but it's a taste of what's to come. We're all going to the El Cap next weekend to see the movie as part of her birthday present. Including my dad (aka G-daddy), who'll be in town to see his G-daughter turn 2. I was able to snag a stuffed Bolt dog at work, and he's her favorite toy of the week. So seeing her light up tonight as much as that sign totally thrilled me. And speaking of something that thrills me, I have an added bonus to this blog post, an early Christmas present, if you will. C and I went to the Grove last weekend for its annual tree-lighting extravaganza. We didn't stay long, missing out on seeing the tree actually light up, but I did get a short video of the event. You can get an idea of how festive it was about an hour or so before the actual ceremony. You can also see that I've got a child who's used to the camera -- and who, come to think of it, maybe could've used a break from it that night. On a holiday best known for its overindulgence, it must be hard to hear the word "No." And not just once, but over and over. Welcome to C's world. C's godparents, Ahmed and Shirleen, hosted a lovely Thanksgiving dinner for close to 20 people, and C was by far the youngest. We had spent most of the day getting organized and hitting Ralphs, where there were so many empty shelves in the baking aisle, you'd have thought it was the Depression ... oh, wait. So, like many other Depression-era folk, I made do -- instead of picking out each ingredient, I grabbed a nice, plump-looking Sara Lee pumpkin pie from the freezer. (OK, not exactly waiting in line for three days for a loaf of bread, I know.) Still not happy with just heating up my dessert, I decided to improvise on another one. I grabbed dark chocolate mini shells, some Jell-O pudding, whipped cream and frozen strawberries and created what I call the Chocolate Red Eye. And C was right there the whole time. After filling the little cups with chocolate pudding and topping them with whipped cream, I grabbed the tub of strawberries (a clue that I don't do this very often) and saw only a frozen red blob. I had to defrost it. Ugh. By the time I did that, the whipped cream had melted into the pudding, so it looked like a muddy pool of goo. I finally got the strawberries to thaw a little and scraped what I could onto the chocolate. By the time I was done, it looked like an eyesore. Literally. Luckily, C didn't care. She ate her little chocolate test cup with total glee. And had a whipped cream moustache to show for it. Once we got to Ahmed and Shirleen's, I delivered my less-than-homemade pie and offensive-looking Red Eyes. But luckily nobody cared. There was so much food, no one noticed my mangled "desserts." C then ran around, entertaining guests, pulling things off shelves, grabbing knives from the table and trying to get a healthy sip of wine at every opportunity -- each time hearing a resounding "No" from her mom. I tried the distraction game and noticed how quickly she liked pointing to things I had said "No" to earlier. It was fun for her; she was teasing me. She was able to eventually overindulge, too, eating everything from biscuits to jambalaya to roast to turkey to coconut cake. I think I'm like every parent in that I love to see my child eat. It somehow reassures me that she's healthy and cared for and also makes me thankful that she doesn't have to wait in line three days for a loaf of bread. I love it, that is, until I see her making a play for the raisins in the glass of mulled wine. Chocolate Red Eyes that seriously could've been props in Saw V? Absolutely! Enjoy the holiday! Will dole out the C deets after the feast. Happy Turkey Day! Original Baby Mama Amy Poehler has joined with Mommy Track'd for this Internet video series called "Smart Girls at the Party." It's no Weekend Update, but it could get there. It's actually a cute Q&A with girls about their likes and dislikes. The former "Saturday Night Live" performer just gave birth herself last month to a baby boy. He was born on a Saturday, natch. Obviously I love my child. I say that because by the time you finish reading this post, you might get the idea that I want to sell her. Unfortunately, this weekend Ian had to work, so I headed back to the Glendale Sears as the solo parent. Let me just say, if you decide to take your child alone, without spousal backup, to get his or her photo taken, especially if it's been a chore every other time, take courage, take strength, take Valium. C was a trouper through the actual picture-taking. She was mesmerized by the faux milk and cookies, transfixed by their seeming sugary goodness. It was only when she scratched the waxy surface of the milk(oid) and tried to eat it that she realized something was up. She certainly enjoyed playing with the toys more than saying cheese, but we got our photos, and that's what really mattered. It was only when we had to wait for the photos to load onto the computer and for me to actually pick them out that things got dicey. My focus was on the computer, and C's focus was on an escape plan. I had to keep her in my lap so she wouldn't leave the studio, and it w as as if I had taped her to the wall and left her there for days. (The photo on the right is something hilarious I found online sans credit. It came up as one of the first images on Google when I typed in "daycare." Yikes.) Of course, there were about 10,000 other children with family in tow in the studio waiting area when the tears and screaming started. Good thing I left my capacity for embarrassment in the delivery room. In total, there were three full-blown, code-red temper tantrums. In the beautiful dress. In the ruffly white socks. And lots of rolling on the floor not laughing. I was so distraught and distracted, I just hope I clicked on the right poses to send out for Christmas. At this point, though, I'm actually just hoping they're photos of the right kid. 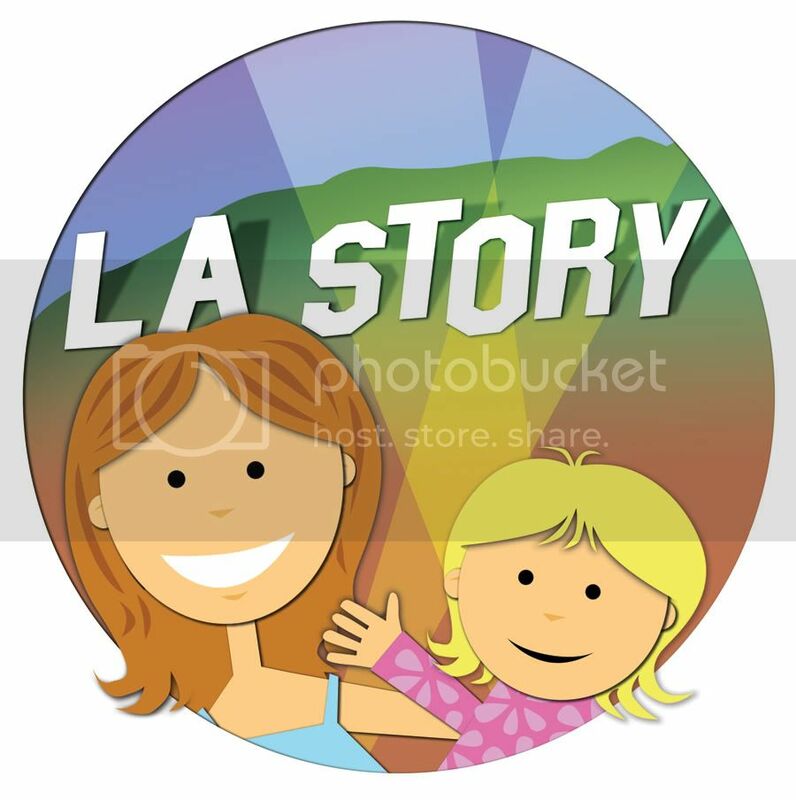 I would like to thank Variety's wonderfully talented graphic designer Cheyne Gateley for creating the L.A. Story logo. It really captures the fun I'm having with C and the blog. Can't wait to keep rocking out in Los Angeles with the hippest Angeleno of them all. Our Monday morning meetings aren't exactly like this. For one thing, we certainly don't have donuts. Who can I talk to about that? Who needs Celebrity Baby Blog when you come home to this L.A. kid every day? Seriously. As part of my occasional "blast from the past" posts (meaning anything pre-blog), I thought I'd include this summer dandy. And, whoa mama, is this a dandy -- I'm talking Tom Wolfe dandy! Gay Talese dandy! Not quite Miss J dandy, but you get the picture. Living in a city that holds all the Baby Jolie-Pitts, Baby Hollabacks, Baby Cruises, Baby Afflecks and, God help us, Baby Nicole Richie, I sometimes pre-fret about Baby C getting caught up in all the celeb madness. But judging by this photo, I think she'll be just fine. As wildfires continue to scorch Southern California, the smoke and other air yuck has really taken its toll on our lungs. So much so, that when I dropped C off at daycare today, her teacher said they weren't letting the kids play outside. Good thinking. Over the past few weeks, the fires have threatened and burned nearby areas, but they haven't encroached on exactly where I live. They were far enough away to seem like something I would only read about or see on TV. But this weekend, that changed. Besides smelling the smoke and soot in the air as I went for a walk, I could also see a hazy funk settling over the city. A funk I didn't want C to be inhaling. 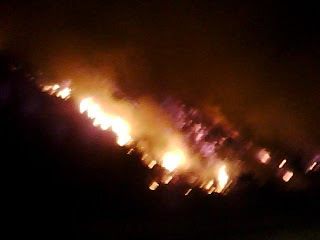 Ian took the above picture a couple weeks ago of a fire that was rampaging around the 405 near the Getty. 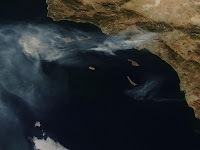 LA Observed pointed me in the direction of NASA pics showing a satellite view (ironically NASA's Aqua satellite) of the smoke blowing over the coast. I can't imagine having to run for my life while everything I owned burned to the ground. Unfortunately, a lot of my fellow Californians can't say the same thing. I'm just glad daycare had the right idea. They'll learn about wildfires soon enough. At least let them breathe easy while they're young. How would Don Draper sell Motrin to moms? Moms all over the blogosphere are buzzing about the above Motrin ad that hit the airwaves this weekend. It basically says that "babywearing" makes you look like an "official mom," but it's also a real pain in the, uh, back. Enter Motrin. Not only that, but the last line is: "And if I look tired and crazy, people will understand why." I'm guessing moms aren't crazy about being called tired and crazy. Although, I'll admit I looked none too sexpot those first couple of months carrying C in her Baby Bjorn. But I think the real question is: How much better would Mad Men's Don Draper have sold it? And can that pitch please be a follow-up to Saturday Night Live's hula-hoop skit with Jon Hamm? I was talking with another mom the other day about C starting daycare, when she asked me if I'd begun looking at preschools. Considering I had just psyched myself up to leave my child with relative strangers both big and small -- granted friendly and playful relative strangers -- I was decidedly un-ready to think about the next step. Even if the next step was something along the lines of "Preschool Musical 3." "Wow, you're worse than we are," she said. "Some parents have had their kids on waiting lists since birth," she said. 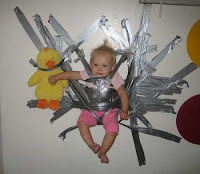 "OMG, I'm like the worst parent ever," I said in my mind and in real life. It was like total panic. In stereo. But then I thought, wait a minute. She must be joking. This early? C isn't even 2, although that will change in a matter of weeks. Even this mom's boys are barely 2 years old themselves. But, she told me, they'll start in the fall, when they're almost 3. In the meantime, it was time to pound the pavement and find the right place. Actually to find the right place to put your name on a list. And wait. She told me I should pick up the Whitney Guide to Preschools and gave me a list of some reputable schools around L.A. Now, we're talking private preschools here, so it's not cheap. But considering the costs of daycare, it could end up being relatively similar. Or maybe I'm just rationalizing. Anyway, my brain is still swimming in this new and bigger pond, but now I have one more thing to obsess over. And, trust me, I will. Yes, you read that correctly. It was 91 degrees today in sunny L.A., and even Santa, flying over the contained, outdoor wonderland that is the Grove, looked as if he could use an icicle or two from the North Pole. Today was supposed to be Christmas picture day for C. Our plan involved making a mad dash to the Gap to pick up a dress, grabbing some lunch at the Farmers Market and then heading up to Glendale, where we would go to Sears and then walk over to the amazing Porto's for dinner. God bless the potato ball. Seriously. But alas, the coveted potato ball, not to mention the potentially nail-biting photo shoot, didn't happen. We did get the dress, and a lovely red one at that. We even made a pit stop to catch a glimpse of the new Variety building, complete with 12-foot-high signage at the top. (It's a couple blocks west of our current building on Wilshire, across the street from LACMA.) In fact, my colleague Mike Schneider blogged about it at his Franklin Avenue address. We almost made it to Glendale. We packed up C, dressed as a beautiful little warm-weather elf, and were driving on Los Feliz Blvd., when our little one got sick in the car. It was really one of those scary moments, when you want to slam on the brakes and screech the car to a halt, possibly landing on the curb, Bond-style. Luckily, I had the wherewithal to turn on my turn signal and pull off on a side street, where we could tend to C properly. I felt so terrible for her, although she seemed perfectly fine once it was all over. We called the doctor, and apparently there's a bug going around. I should have known. I should have known the second Ian threw his gum out of the car window as we were heading toward the Grove and it landed on the hood of a Lexus SUV in the next lane. "Just look straight ahead and keep driving," he said. "This is not a promising start to the day." 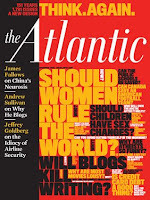 In the November issue of the Atlantic, Andrew Sullivan writes a compelling piece titled "Why I Blog." Besides describing what exactly a blog is and its evolution over the past 10 or so years, he puts the inherently ephemeral idea of the blog itself into a concrete context. He knowingly compares the task itself to fishermen who are "at sea." An apt metaphor for a form of writing that is often instantaneous and off-the-cuff. He writes: "Logs require a letting-go of narrative because they do not allow for a knowledge of the ending." So true. The very act of this unrefined genre of writing seems to capture life, like lightning, in a bottle. Its moment is always thisclose from being over, which makes every post so immediate. In chronicling the growth of my daughter, this is particularly true. Everything is immediate. Everything is almost past. Each moment slips through my fingers before I even have a chance to record it. And that's also the nature of blogging. Second-guessing is also a part of it, which Sullivan candidly notes. Did I choose the right photo, did I pick the right word? Did I say something I might later regret? "But blogging requires an embrace of such hazards," he argues, "a willingness to fall off the trapeze rather than fail to make the leap." "The wise panic that can paralyze a writer—the fear that he will be exposed, undone, humiliated—is not available to a blogger. You can’t have blogger’s block. You have to express yourself now, while your emotions roil, while your temper flares, while your humor lasts. You can try to hide yourself from real scrutiny, and the exposure it demands, but it’s hard. And that’s what makes blogging as a form stand out: it is rich in personality." So why do I blog? Because these moments are already over, these pictures have already been taken, and although I don't know the end of this particular story, I will want to know -- and I'll want C to know -- how we got there. No, I am not Kevin Nealon. Nor did I write this book. Or even ghost-write it, for that matter. So it's not exactly (well, complete) self-promotion. It's more like indirect self-promotion by way of promoting someone else. Whoa. Too much self. Too much promotion. Moving on. What I did do, however, was write a review of his book for Variety. "Yes, You're Pregnant, But What About Me?" is a funny look at how this comedian copes with having a baby -- and all the joys (read: harrowing obstacles) that lead up to that moment -- at 53. My friend and fellow Amherst alum Diane at work gave it to me to review this summer because she thought I could relate. Well, not to the 53-year-old man part, but, you know, the whole baby thing. 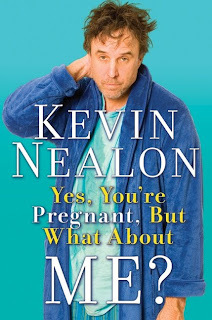 What neither she nor I knew at the time was just how much Kevin Nealon and I have in common. First, he and his wife, Susan, got married on the same day as Ian and I. Same month, same day, same year. Not only that, but their baby was born only about a month after C. And, not only that, but they named him Gable ... as in Clark Gable. Clark! It's uncanny, and part of me wants to set up my baby with his baby. (Well, the same part of me that wants to eat 12 donuts a day but doesn't really.) In real life, I want to high-five him (that's coming back, you know) or make that motion with your two fingers, where you point to your eyes and then to someone else's eyes and then back to your eyes. The one that says, I get you. What made me think of blogging about this, I should admit in another moment of shameless self-promotion, is that I just wrote another review for Variety, about Ethan Mordden's biography "Ziegfeld: The Man Who Invented Show Business". This book is also a great read but for different reasons. Mordden chronicles the life of Broadway uber-producer Florenz Ziegfeld and how he became a Rialto legend. It's filled with tons of well-researched material as well as juicy snark from the author. Luckily, so far, I've gone two for two. Not to diss on veterans (my dad happens to be one), but, man, did the holiday honoring our nation's defenders really provide some unexpected shock and awe. When we dropped off C at daycare on Monday, I let out a big sigh of relief that we had solved a potential stressor. Of course we hadn't been there five minutes before I was told, "Oh, by the way, we're closed tomorrow for Veteran's Day." You've got to be kidding me ... I said only in my mind. (Didn't want to sound testy on the first day. Heck, the first few minutes.) But after all this, I was still going to have to take a day off of work with very little notice the very first day I secure daycare for my daughter? Oh, the irony. We decided to meet my friend Vickey and her son, G, over at the Los Angeles County Museum of Art, aka LACMA. 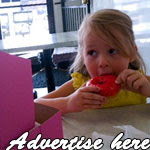 They have a great NexGen program, where c hildren up to age 18 can join for free. With their membership they can take along an adult as a guest also for free. So, I was C's (cheap) date to the museum. The kids had a great time. C, as usual, was unstoppable. Literally. Like trying to catch a cloud and pin it down ("Sound of Music" shoutout!). She chased little G all around the courtyard in an effort to land a hug. While Vickey and I sat down, trying to catch our breath, we listened to some live classical music that was playing in the LACMA courtyard. It was a mix of flutes and cellos and violins. Before one tune, a woman said, "I'd like to introduce to you one of my favorite songs, it's very special to me, something from the 13th century ..." Seriously? 13th century? I wasn't expecting Huey Lewis from 1982, but 1265? I've never heard anyone refer to a fave tune as being anything remotely close to a year in the 1200s. We decided to take in just one exhibit. With two almost-2-year-olds, that's pretty ambitious. Hoping to avoid anything breakable, we chose the Vanity Fair Portraits: Photographs 1913-2008. The photos were fascinating, pictures of people from D.H. Lawrence, to Igor Stravinsky all the way to J. Lo and George Clooney. Of course, C decided to run in circles while grown-ups lined up single file to leisurely peruse the photographs on the walls. One woman came up to me and said, "She's really cute but probably not a good place for her here." To her credit, she was emphasizing the "cute" part more than the "What do you think you're doing bringing your toddler to a museum?" aspect of the sentence that I latched onto. Excuse me?! I'm treating my child to art and culture ... I said in my mind. "Thank you. She's full of energy," I said in real life. I'm hoping the appreciation will come later. Thank you, NexGen. As we were leaving, I looked down the street to where my office is located. It was strange not being there. I wasn't sick, and I wasn't on vacation, so this was a day I couldn't quite categorize. What was nice was spending time with C and with my friend and her little one, something I don't get to do very often. Thank you, too, veterans. I couldn't have done it without you. And as for that hug C was chasing down ... she got it. Unstoppable, I tell you. Well, we mustered up the courage and did it. Yes, yesterday was C's first day of daycare. It was actually uncanny how quickly she acclimated to daycare life. When we arrived, all the little kids were sitting in mini chairs around a table for "circle time." They each drew on sheets of paper that had monkeys and elephants on them. "I like monkeys," one read. "I like elephants," read another. And C joined right in. In fact, it was Ian and I who were getting choked up. The daycare owner had told us not to linger, that it would be hard on the child if her parents stuck around. 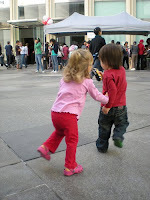 But we couldn't help but linger a little bit, just to watch our little C mingle with the other toddlers. She even comforted a little girl who was crying by patting her on the shoulder. Shouldn't that have been the other way around? It was clear she was just fine. Her parents, however, needed a few moments to adjust. Yes, saying goodbye can be traumatic ... but why not have some fun before the actual parting? Stephani heads out early tomorrow morning, and she wanted to log another quick farewell before the big day. As you can see, C was having a great time, opening presents, playing with Stephani and commanding center stage as usual. I had to take a step back while C and Stephani shared some time together, and it was a little discombobulating, knowing something that C couldn't quite grasp. She loves Stephani. Loves. Completely. But I'm also completely sure that she doesn't know that this goodbye is for awhile ... not just a weekend. It's difficult to know just what children perceive, but I'm hoping it doesn't hit her like a ton of bricks in a few days. Actually, tomorrow is her first day of daycare. Ian and I have checked it out, and it looks really promising. About 14 kids and lots of toys. It's also funny when you realize your child could be ready to move on to the next stage. This might be good timing, after all. 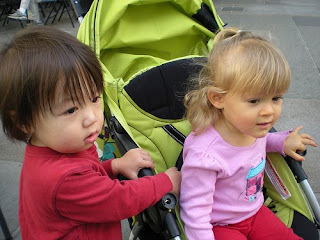 Last Wednesday, C's wonderful nanny Stephani said that she would be leaving us and heading back home. I've been in denial ever since. Stephani has been a part of the family for nearly all of C's life, and it's really sad to see her go. She's been a true rock for us and has helped out immeasurably. C adores her, gets so excited when she knocks on the door, and it's difficult to imagine her not being there every day. One of the things I'll miss most, other than her loving relationship with C, is her saying "Happy Goodnight" each evening before she left. We'll miss you, Stephani. Hope you come back soon. My intentions were good. Honest. I researched the candidates, watched the debates, read through the voting guide, you betcha. But in the end, what I hadn't researched was how well toddlers mix with the voting booth. I was so determined to take C to her first election, to make her part of the process. I had heard or read somewhere that polling places were even encouraging it, showing childre n that voting is very important, part of our American fabric. Well, sanity is equally important. Let's just say there was lots of screaming, lots of crying and lots of "No, no, no." And C let loose herself, too. My plan was to show C the voting process, then go to Starbucks and Krispy Kreme, where they wer e giving away free donuts and coffee to those who proudly displayed the "I Voted" sticker. It was going to be Mrs. Clark (and tot) goes to Starbucks ... or something like that. I got the sticker, all right. But that's all. C terrified the voting people so much that I'm afraid instead of the hanging chad, this year people's votes won't count because of "screaming child." Forget Obama or McCain. I'm convinced voters got so flustered, they mistakenly checked the box for someone named Rocky L. Crabb. No joke. I did read through all the ballot propositions, but the candidates for superior court judge slipped through the cracks. At some point, it's seems like going to the races and picking the best-named horse. I hate to admit it, but it's true. That's why I intentionally shied away from Mr. Crabb. I'm sure he's a lovely person, but when I'm deciding between two essentially anonymous government officials, I don't want to vote for someone just because his name sounds like a Triple Crown winner. Sorry, Mr. Crabb. After the vote ... and this is after a nice woman offered to hold C while I voted, which only produced cries of horror from my child and after one of the volunteers hurried me to a booth to shorten the screaming time ... I presented my ballot while C continued her wailing. Another volunteer looked totally aghast, quickly ripping off not one but three "I Voted" stickers in the hopes that it would quiet her down. It didn't, and we headed straight home. No Starbucks. No Krispy Kreme. Let's hope I can get my coffee and donut at some point today.